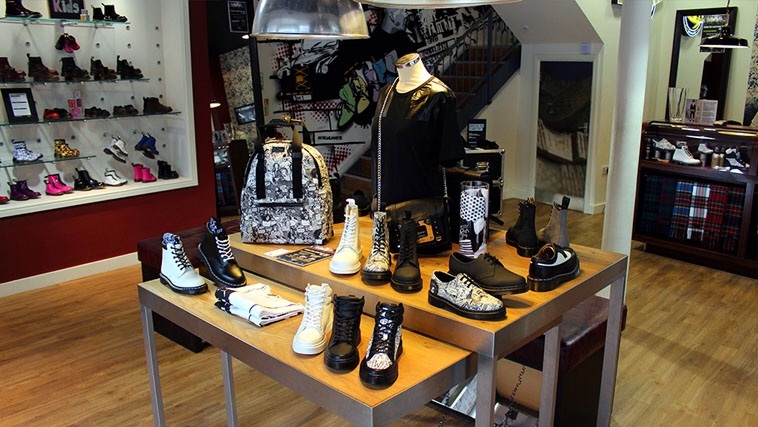 Dr. Martens: Do You Remember Your First Time? 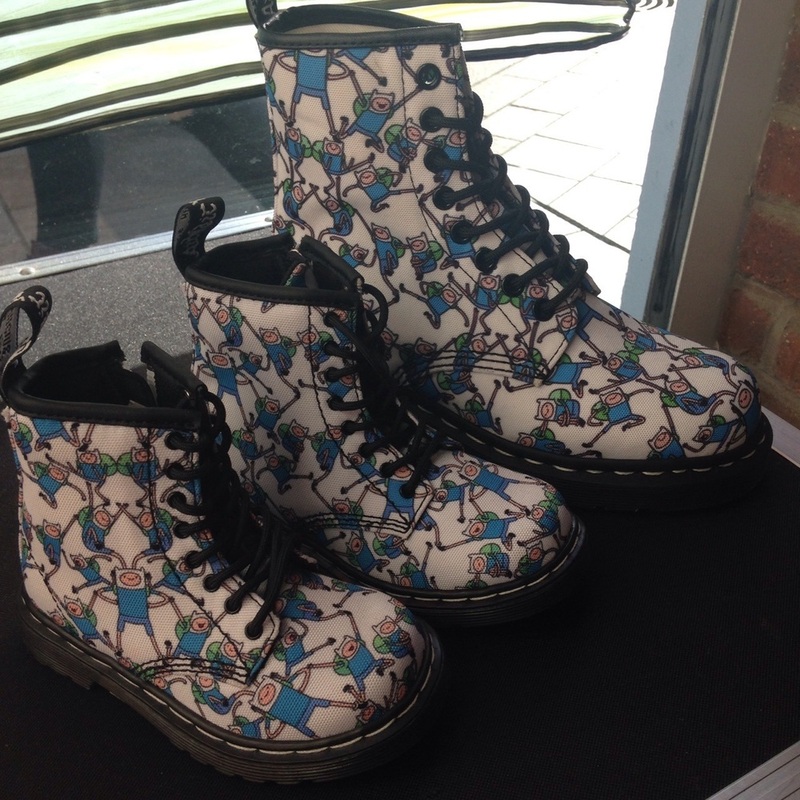 Last week, Dr. Martens got in touch and wanted to offer Michael his first ever pair of DMs. 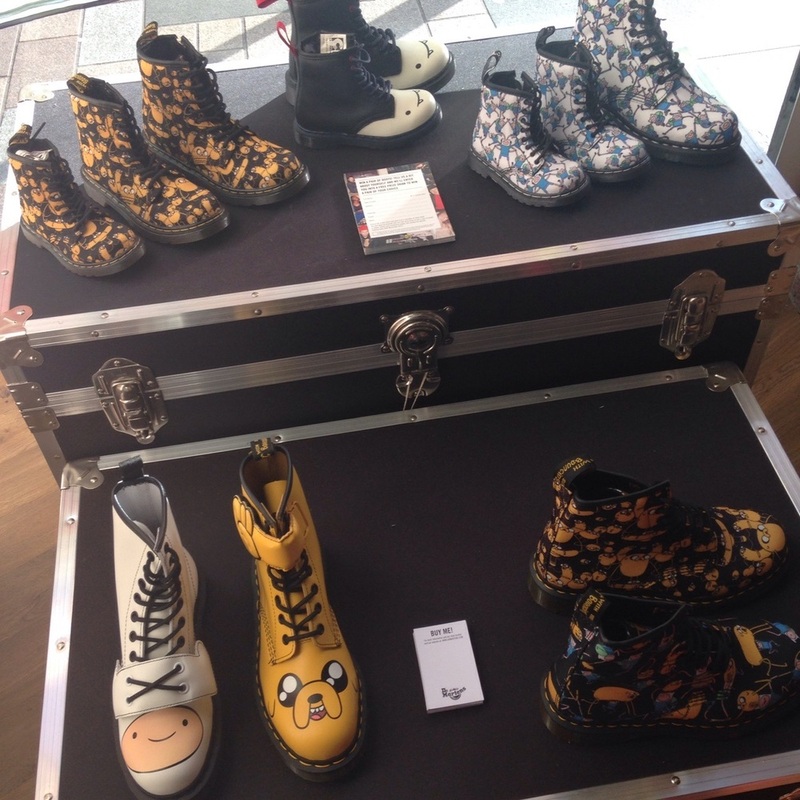 They currently have an Adventure Time themed collection, in kids' and adult sizes. Fans of the quirky cartoon will love these, and you can even wear your Adventure Time fandom subtlety with the Marceline design in black & white. So as it was half term, Michael and I took a trip up to the Belfast Doc Shop so he could choose a pair, and of course pop into Yo Sushi, it would have been rude not to. 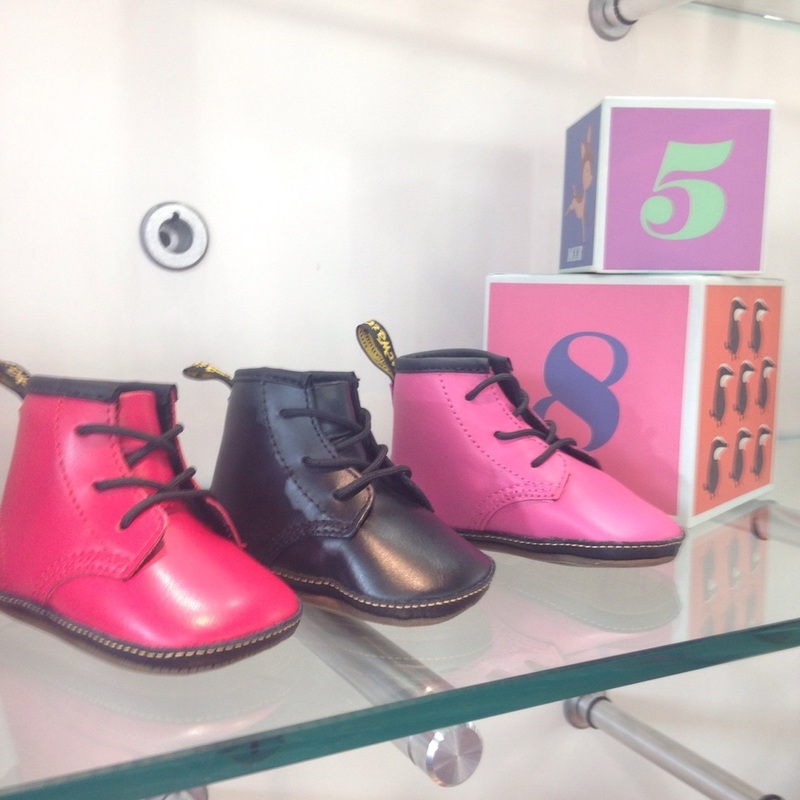 The Cornmarket sited store is packed with designs for all the family, right down to newborn sized booties. 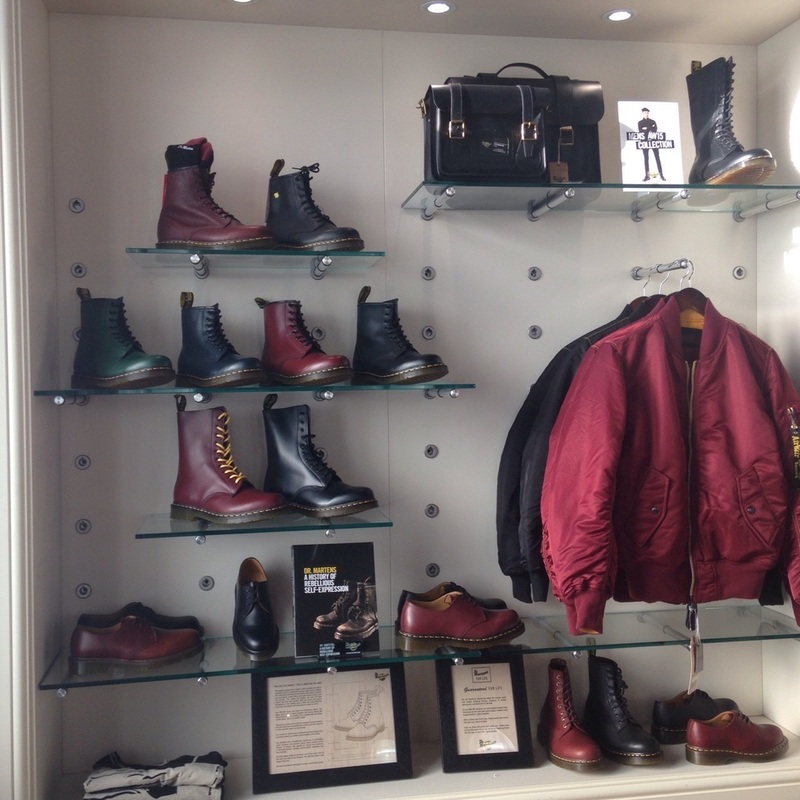 Belfast Dr. Martens store downstairs. I was pretty peeved off that Michael wouldn't choose a pair, as it's a really great quality boot to have, and go only has trainers really. But what can you do? I wasn't going to force a pair on him. Although when he found out later his best friend Connie has a shiny black pair, I think he wished he hadn't thrown a strop? 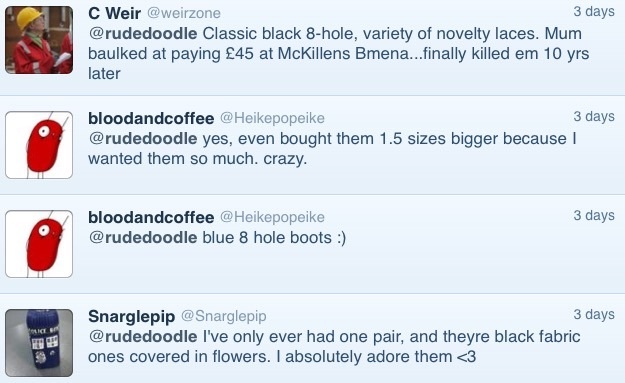 I actually am 'well stocked' in Dr. Marten's boots myself. 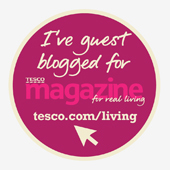 I have mid-calf high zip up boots in black, which still are as new despite being worn for three winters of icy school runs and coastal path danders. Before them I owned the same design in brown. My newest pair I wore along to the store visit. I got them last October and chose a design with a little more height, ox blood, matt, knee-heigh zip ups. That's them below. In the store's flash sale they had this ankle boot, Gayle, down from £95 to £65. I think for the quality and longevity of a pair of Doc Martens, that's a very decent price. You could look at it this way; they last so well that in 7 years time when you are still using them for Autumn and winter, you'll have paid less than £10 a year. It's simple, shopping mall mathematics, or rather any excuse to buy some lovely boots. 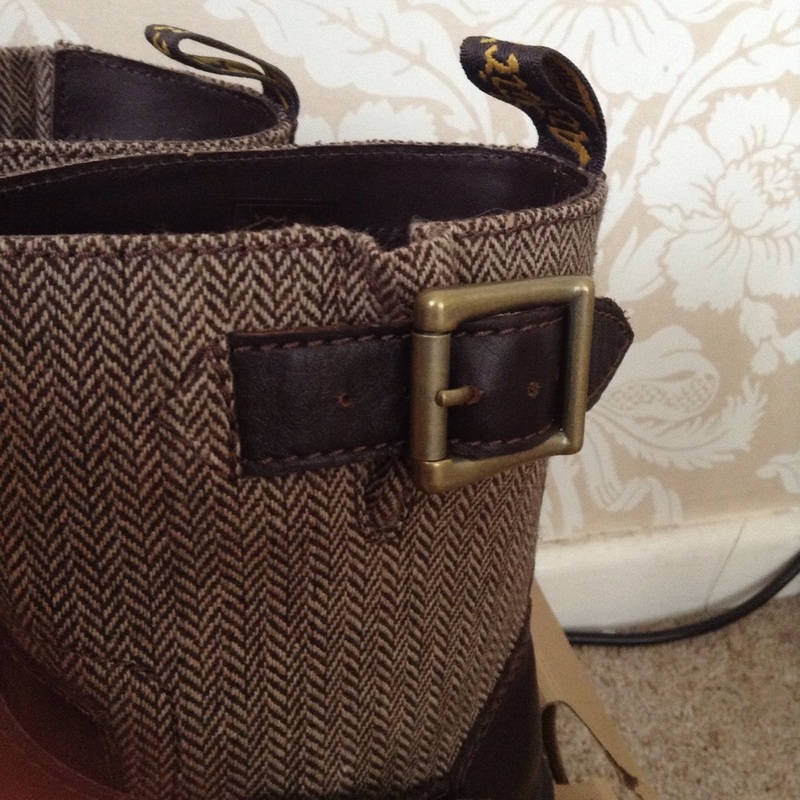 The tweed print is what drew me to this pair, which is also available in black. 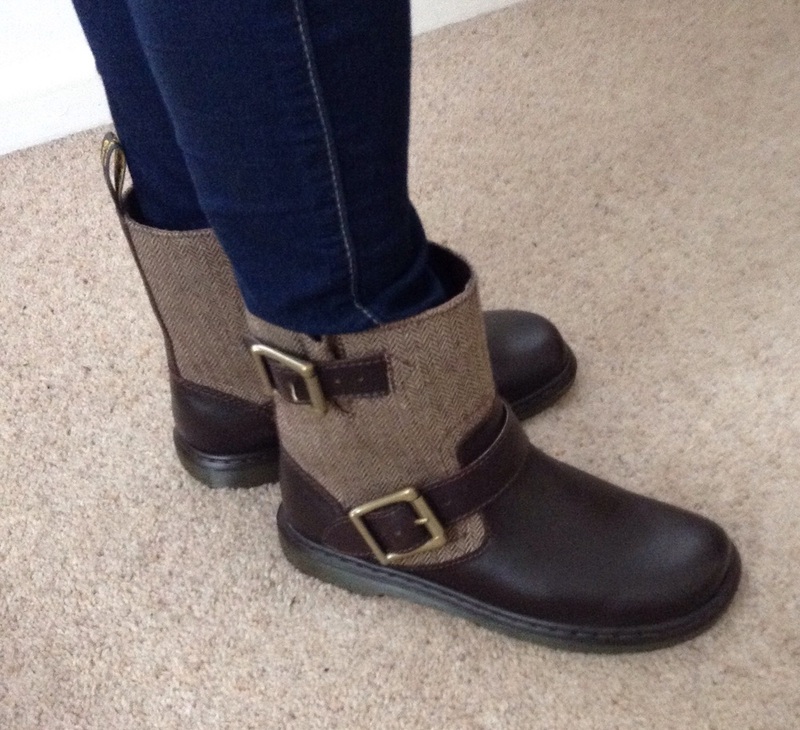 The buckles are adjustable, but with my tiny ankles I don't need to undo them to put them on. I'm not a huge fan of ankle boots, but these I like. And to keep them looking new every autumn, they included this water & stain spray, which I can use to liven up my existing pairs, and even leather handbags, or suede, or nubuck. 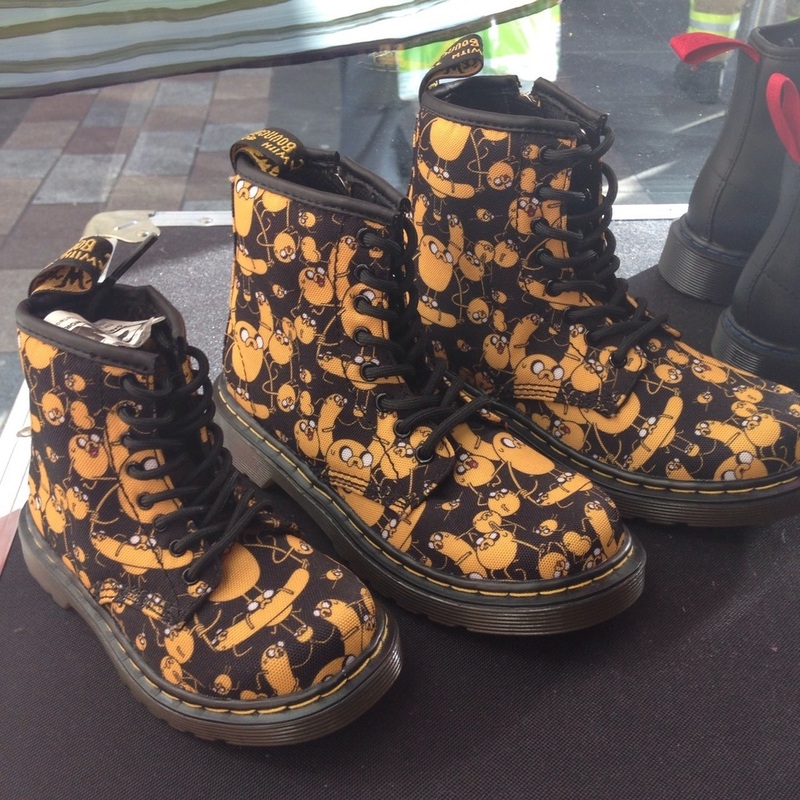 So I was disappointed that Michael didn't want to play along and receive his first ever Dr. Martens, but it made me remember MY first pair. I was about 13 or 14, so it must have been the early 90s. EVERYONE had Dr. Marten boots. I remember one non-uniform day at Sullivan Upper, my schoo, and at least half the class proudly sporting the cherry red, ox blood red, or black boots. I really, REALLY wanted a pair. It wasn't the price that was the problem, my Mum didn't mind paying that sort of price for winter boots, but my parents really didn't want their little 13 year old girl, stomping around in big boots that they were used to seeing punks wearing. Finally they gave in, but I couldn't get leather, or black, or loads of height. My first pair were suede, green, six eyelet boots and I LOVED them. So, thinking Michael was supposed to get his first ever pair, and thinking about my green, suede wonders, I decided to ask Twitter did they remember their first pair of Dr. Martens. So many people replied, with fond stories about them at that age, or what they got up to in their first pair. Many, like me, had to convince their middle class, church-going, Northern Irish parents, that Dr. Martens weren't just for punks or naughty boys & girls. Now we would think nothing of getting a child a pair, there's even newborn baby size! 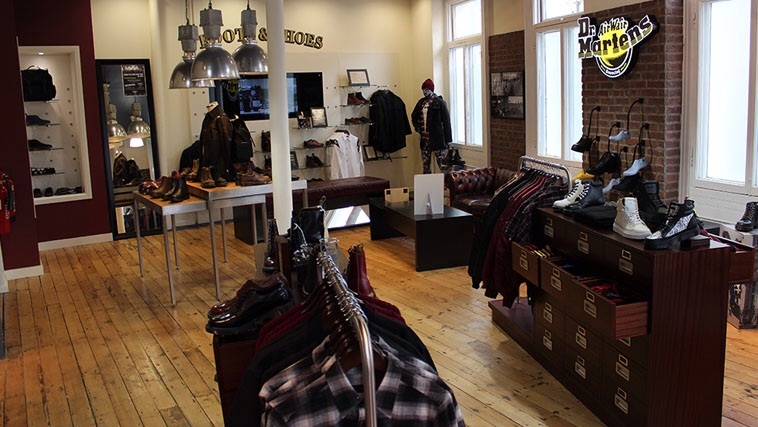 So it's clear Dr. Martens as a brand means more than just fashion, when people have such clear memories of their first pair. Signing off, here's a selection of the replies.